That is absolutely correct and I agree with Mugo/Peter. It was also discussed on the forums and at many places. "contentS" is something to ban as it's not really english. In this context, it can be one content item or several, hence I think both "assign to content" (number being undefined) and "assign to content items" works. The 1st option "assign to content" is more simple and compact, so I think it's a better choice. Roland Benedetti added a comment - 27/Nov/15 10:36 PM That is absolutely correct and I agree with Mugo/Peter. It was also discussed on the forums and at many places. "contentS" is something to ban as it's not really english. In this context, it can be one content item or several, hence I think both "assign to content" (number being undefined) and "assign to content items" works. 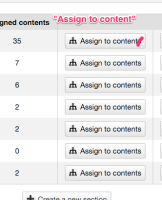 The 1st option "assign to content" is more simple and compact, so I think it's a better choice.